Sweaty and hot from dancing in the cabin all night, Clarie stepped outside. 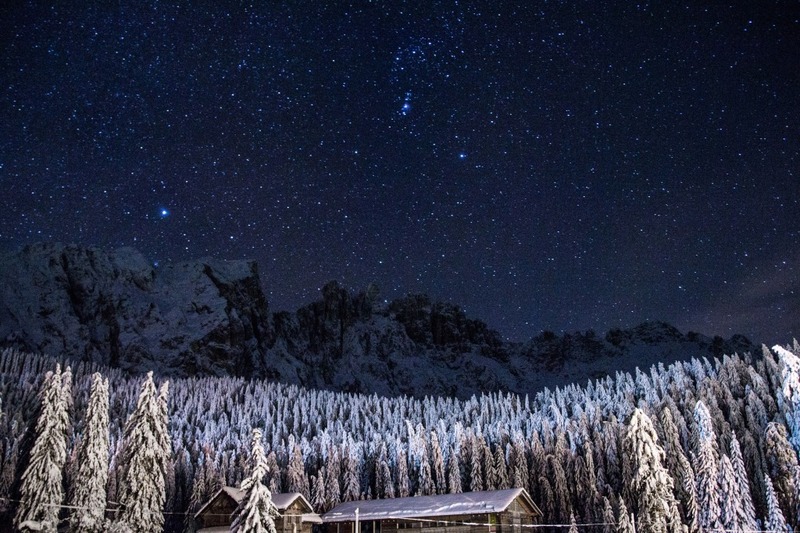 The new moon cast its shadowed face on the snow-covered firs covering the mountainside. But the stars. It was their bright points of light that glimmered and made the ice crystals shimmer like a priceless blanket. The crisp air cooled Clarie’s face and neck. She zipped up her jacket and moved down the front steps of the lodge, her feet crunching in the snow as she went. The sounds of music and laughter wafted from the party she’d just left, a college graduation bash. It was something she’d never done before; cross-country skiing into the untouched Sierra Nevada landscape to stay at a secluded lodge. Clarie tilted her head back to gaze at the stars. Her breath billowed into a cloud above her as her eyes traced from one series of points to another. Across the snowy meadow rose the pointed forest. She thought she saw two glassy orbs reflect back at her, and she squinted into the dark, imagining a coyote watching her from afar. A burst of screams and laughter came from the lodge once again. Clarie turned to gaze back at the stone and wood building. Smoke filtered from the chimney into the night sky. She smiled and returned her focus to the wilderness. The silhouette of a man stood fifty yards away in the clearing of the snow-covered meadow. His head was tilted back to stare at the stars. Clarie’s breath caught in her throat. She hadn’t seen him moments before, she was sure. “Who are you?” her voice cracked as she called out. He continued to stare at the constellations. Had he heard her or was he simply ignoring the question? Clarie swallowed. Maybe he lived nearby or was the caretaker of the property. Just as she was questioning if she should call out to him again, he turned to look at her. Though he was a distance away, the snow reflected what little light there was into a dull glow. His dark hair came down to his shoulders, and his eyes blinked curiously at her. He began to walk toward her. Clarie tried to step back, but she couldn’t. She found herself fixed in place. So, she simply watched his approach. Her voice had gone out, like a candle’s flame in the wind. When the man was only a few strides away from her, the light from the lodge illuminated his almond skin and hazel eyes. There was no appearance of madness or anger, simply curiosity. He came even closer, dressed all in black, and she wondered at his handsome features instead of fearing for her life. He came to stand beside her and pointed up to the moon. She followed his focus to the darkened astronomical body and breathed in the smell of the firs. He said nothing to her, made no noise. He held out his hand, palm up. Clarie couldn’t help herself. She raised her hand to touch his. His skin was cool and smooth. It felt the way a human’s flesh should feel, but she knew he was something else. Something more. From somewhere behind her, an owl hooted into the expanse. She looked but couldn’t spot the animal. Clarie returned her gaze forward. Her hand was still held up in the chilly air, though the man was gone. She stared into the horizon, but there was no sign of him anywhere. No footprints, no silhouette, no hazel eyes. The edge of the moon shined bright, its crescent aglow. Clarie raised her palm to the sky, letting its light bath her skin just as the sharp cries of a coyote filled the night.